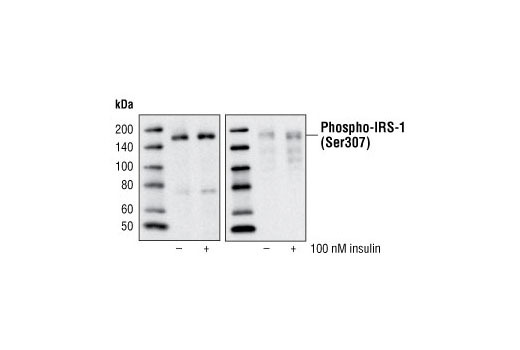 The Insulin Receptor Substrate Antibody Sampler Kit provides an economical means to investigate IRS-1 and IRS-2 signaling and phosphorylation within the cell. 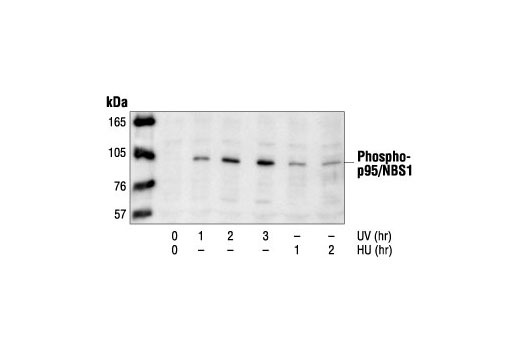 The kit contains enough antibody to perform two western blots with each primary antibody. Background: Phosphoinositide 3-kinase (PI3K) catalyzes the production of phosphatidylinositol-3,4,5-triphosphate by phosphorylating phosphatidylinositol (PI), phosphatidylinositol-4-phosphate (PIP), and phosphatidylinositol-4,5-bisphosphate (PIP2). Growth factors and hormones trigger this phosphorylation event, which in turn coordinates cell growth, cell cycle entry, cell migration, and cell survival (1). PTEN reverses this process, and research studies have shown that the PI3K signaling pathway is constitutively activated in human cancers that have loss of function of PTEN (2). PI3Ks are composed of a catalytic subunit (p110) and a regulatory subunit. Various isoforms of the catalytic subunit (p110α, p110β, p110γ, and p110δ) have been isolated, and the regulatory subunits that associate with p110α, p110β, and p110δ are p85α and p85β (3). In contrast, p110γ associates with a p101 regulatory subunit that is unrelated to p85. Furthermore, p110γ is activated by βγ subunits of heterotrimeric G proteins (4). Background: The Na,K-ATPase is an integral membrane heterodimer belonging to the P-type ATPase family. This ion channel uses the energy derived from ATP hydrolysis to maintain membrane potential by driving sodium export and potassium import across the plasma membrane against their electrochemical gradients. It is composed of a catalytic α subunit and a β subunit (reviewed in 1). Several phosphorylation sites have been identified for the α1 subunit. Tyr10 is phosphorylated by an as yet undetermined kinase (2), Ser16 and Ser23 are phosphorylated by PKC, and Ser943 is phosphorylated by PKA (3-5). All of these sites have been implicated in the regulation of enzyme activity in response to hormones and neurotransmitters, altering trafficking and kinetic properties of Na,K-ATPase. Altered phosphorylation in response to angiotensin II stimulates activity in the rat proximal tubule (6). 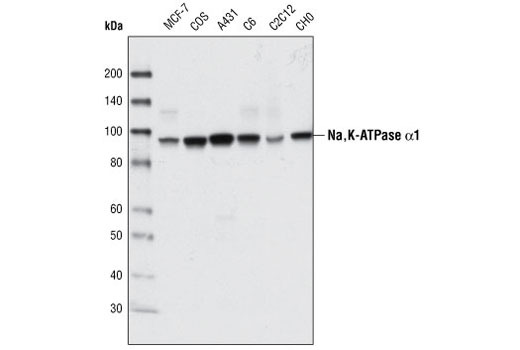 Na,K-ATPase is also involved in other signal transduction pathways. Insulin regulates its localization in differentiated primary human skeletal muscle cells, and this regulation is dependent on ERK1/2 phosphorylation of the α subunit (7). Na,K-ATPase and Src form a signaling receptor complex that affects regulation of Src kinase activity and, subsequently, its downstream effectors (8,9). Background: The c-Abl proto-oncogene encodes a nonreceptor protein tyrosine kinase that is ubiquitously expressed and highly conserved in metazoan evolution. c-Abl protein is distributed in both the nucleus and the cytoplasm of cells. It is implicated in regulating cell proliferation, differentiation, apoptosis, cell adhesion, and stress responses (1-3). c-Abl kinase activity is increased in vivo by diverse physiological stimuli including integrin activation; PDGF stimulation; and binding to c-Jun, Nck, and RFX1 (2,4). The in vivo mechanism for regulation of c-Abl kinase activity is not completely understood. Tyr245 is located in the linker region between the SH2 and catalytic domains. This positioning is conserved among Abl family members. Phosphorylation at Tyr245 is involved in the activation of c-Abl kinase (5). In addition, phosphorylation at Tyr412, which is located in the kinase activation loop of c-Abl, is required for kinase activity (6). Background: Death-associated protein kinase (DAPK1) is a Ca2+/calmodulin-regulated serine/threonine kinase that participates in a wide range of apoptotic signals including interferon-γ, tumor necrosis factor α, Fas, activated c-Myc, and detachment from the extracellular matrix. In addition to the kinase domain and calmodulin regulatory segment, DAPK1 also has eight ankyrin repeats, a cytoskeleton binding region, and a conserved death domain (1-3). Deletion of the calmodulin-regulatory domain generates a constitutively active mutant kinase. Ectopic expression of wild-type DAPK1 induced cell death in HeLa cells. Conversely, expression of a catalytically inactive mutant protected cells from interferon-γ-induced cell death (4). The catalytic domain of DAPK1 has very high sequence similarity to vertebrate myosin light chain kinase (MLCK) and a RXX(S/T)X motif derived from myosin light chain protein was shown to be phosphorylated in vitro by DAPK1 (5). Background: In response to cytokines, stress, and chemotactic factors, MAP kinase-activated protein kinase 2 (MAPKAPK-2) is rapidly phosphorylated and activated. 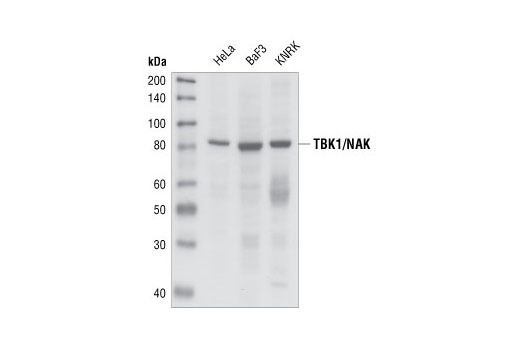 It has been shown that MAPKAPK-2 is a direct target of p38 MAPK (1). 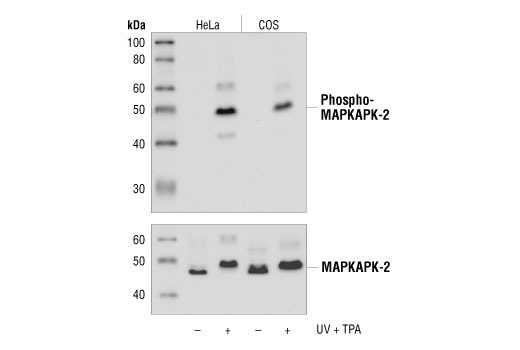 Multiple residues of MAPKAPK-2 are phosphorylated in vivo in response to stress. However, only four residues (Thr25, Thr222, Ser272, and Thr334) are phosphorylated by p38 MAPK in an in vitro kinase assay (2). Phosphorylation at Thr222, Ser272, and Thr334 appears to be essential for the activity of MAPKAPK-2 (2). Thr25 is phosphorylated by p42 MAPK in vitro, but is not required for the activation of MAPKAPK-2 (2). Background: Nijmegen breakage syndrome (NBS) is characterized by growth retardation, mental disability, immunodeficiency, defects in cell cycle checkpoints, an increased propensity for cancer, and sensitivity to ionizing radiation (1). Repair of radiation-induced DNA double-strand breaks is dependent on the multifunctional MRN complex containing Mre11, Rad50, and the NBS1 gene product p95/NBS1 (also called p95 or nibrin) (2). 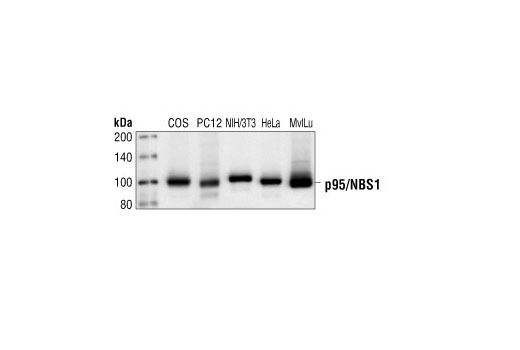 p95/NBS1 is a protein with a forkhead-associated domain and a BRCT repeat that regulate interaction with MDC1 and are essential for proper G2/M DNA-damage checkpoint function (3). NBS1 is critical for homologous recombination following DNA double strand breaks. This activity requires CDK-dependent association with CtIP and subsequent phosphorylation by ATM (4). ATM interacts with and phosphorylates p95/NBS1 at Ser278 and Ser343 after exposure to ionizing radiation (5,6). Background: Activation of protein kinase C (PKC) is one of the earliest events in a cascade that controls a variety of cellular responses, including secretion, gene expression, proliferation, and muscle contraction (1,2). PKC isoforms belong to three groups based on calcium dependency and activators. Classical PKCs are calcium-dependent via their C2 domains and are activated by phosphatidylserine (PS), diacylglycerol (DAG), and phorbol esters (TPA, PMA) through their cysteine-rich C1 domains. Both novel and atypical PKCs are calcium-independent, but only novel PKCs are activated by PS, DAG, and phorbol esters (3-5). Members of these three PKC groups contain a pseudo-substrate or autoinhibitory domain that binds to substrate-binding sites in the catalytic domain to prevent activation in the absence of cofactors or activators. Control of PKC activity is regulated through three distinct phosphorylation events. Phosphorylation occurs in vivo at Thr500 in the activation loop, at Thr641 through autophosphorylation, and at the carboxy-terminal hydrophobic site Ser660 (2). Atypical PKC isoforms lack hydrophobic region phosphorylation, which correlates with the presence of glutamic acid rather than the serine or threonine residues found in more typical PKC isoforms. 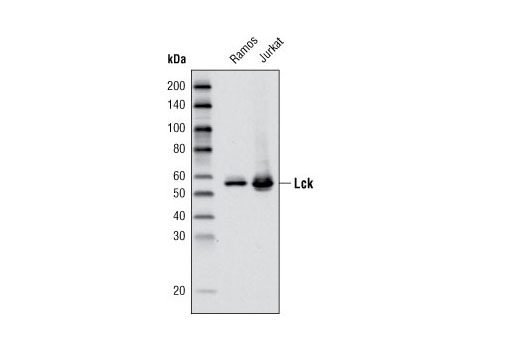 The enzyme PDK1 or a close relative is responsible for PKC activation. A recent addition to the PKC superfamily is PKCμ (PKD), which is regulated by DAG and TPA through its C1 domain. PKD is distinguished by the presence of a PH domain and by its unique substrate recognition and Golgi localization (6). 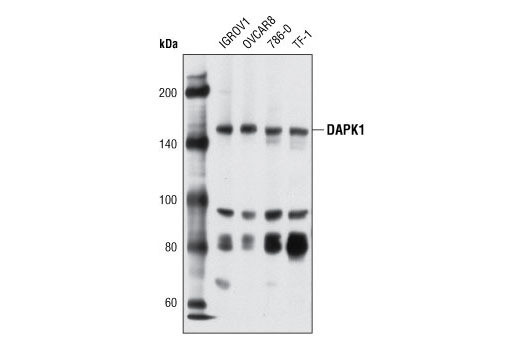 PKC-related kinases (PRK) lack the C1 domain and do not respond to DAG or phorbol esters. 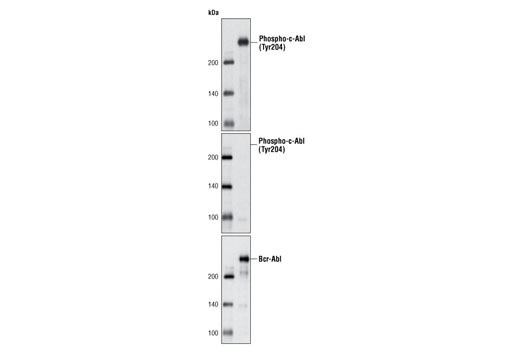 Phosphatidylinositol lipids activate PRKs, and small Rho-family GTPases bind to the homology region 1 (HR1) to regulate PRK kinase activity (7). Background: Many growth factors and hormones induce the phosphoinositide 3-kinase signaling pathway, which results in the activation of downstream effector proteins such as the serine/threonine kinase Akt (1,2). 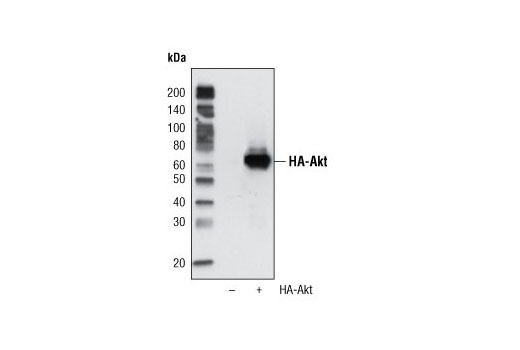 One known Akt substrate is a 40 kDa, proline-rich protein (PRAS40) that binds to 14-3-3 proteins (2). PRAS40 also binds mTOR to transduce Akt signals to the mTOR complex. Inhibition of mTOR signaling stimulates PRAS40 binding to mTOR, which in turn inhibits mTOR activity (3). PRAS40 interacts with raptor in mTOR complex 1 (mTORC1) in insulin-deprived cells and inhibits the activation of the mTORC1 pathway mediated by the cell cycle protein Rheb. 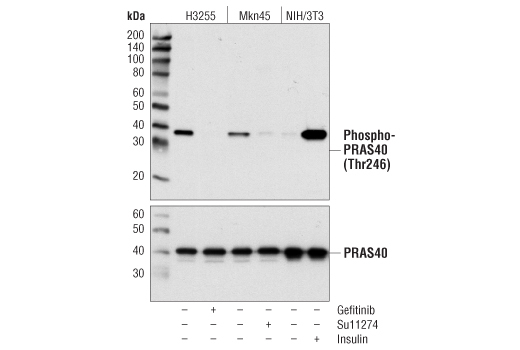 Phosphorylation of PRAS40 by Akt at Thr246 relieves PRAS40 inhibition of mTORC1 (4). 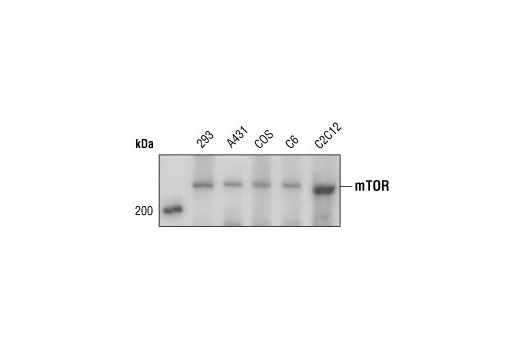 mTORC1 in turn phosphorylates PRAS40 at Ser183 (5). Background: SET domain-containing lysine methyltransferase 8 (SET8), also known as PR/SET domain-containing protein 7 (PR/SET7), is a member of a family of histone lysine methyltransferases, each of which contains a conserved catalytic SET domain originally identified in Drosophila Su[var]3-9, Enhancer of zeste, and Trithorax proteins (1-3). SET8 is a single-subunit enzyme that mono-methylates histone H4 on Lys20, preferably on nucleosomal substrates (1-3). SET8 protein levels and Histone H4 Lys20 methylation are cell cycle regulated, both increasing in S phase and peaking at G2/M phase (4,5). SET8 interacts with the PCNA protein, associates with sites of active DNA synthesis, and is required for DNA replication and genome stability during S phase (5-7). Inhibition of SET8 using shRNA or siRNA results in arrest of replication forks, induction of double-stranded DNA breaks, and a Chk1-mediated cell-cycle arrest in S and G2/M phases of the cell cycle (6,7). Furthermore, SET8 methylates p53 on Lys382, down regulating the pro-apoptotic and checkpoint activation functions of p53 (8). In response to DNA damage, SET8 expression levels decrease, allowing p53 to activate checkpoints and/or apoptosis (8). Both the methylation of histone H4 Lys20 and p53 appear to be important for the functions of SET8 in S phase. Background: c-Jun is a member of the Jun family containing c-Jun, JunB, and JunD, and is a component of the transcription factor activator protein-1 (AP-1). AP-1 is composed of dimers of Fos, Jun, and ATF family members and binds to and activates transcription at TRE/AP-1 elements (reviewed in 1). Extracellular signals including growth factors, chemokines, and stress activate AP-1-dependent transcription. 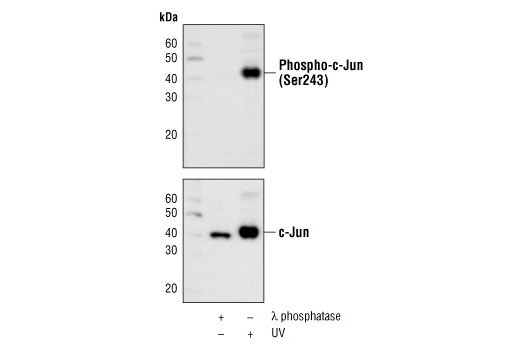 The transcriptional activity of c-Jun is regulated by phosphorylation at Ser63 and Ser73 through SAPK/JNK (reviewed in 2). Knock-out studies in mice have shown that c-Jun is essential for embryogenesis (3), and subsequent studies have demonstrated roles for c-Jun in various tissues and developmental processes including axon regeneration (4), liver regeneration (5), and T cell development (6). AP-1 regulated genes exert diverse biological functions including cell proliferation, differentiation, and apoptosis, as well as transformation, invasion and metastasis, depending on cell type and context (7-9). Other target genes regulate survival, as well as hypoxia and angiogenesis (8,10). Research studies have implicated c-Jun as a promising therapeutic target for cancer, vascular remodeling, acute inflammation, and rheumatoid arthritis (11,12). Background: Platelet derived growth factor (PDGF) family proteins exist as several disulphide-bonded, dimeric isoforms (PDGF AA, PDGF AB, PDGF BB, PDGF CC, and PDGF DD) that bind in a specific pattern to two closely related receptor tyrosine kinases, PDGF receptor α (PDGFRα) and PDGF receptor β (PDGFRβ). PDGFRα and PDGFRβ share 75% to 85% sequence homology between their two intracellular kinase domains, while the kinase insert and carboxy-terminal tail regions display a lower level (27% to 28%) of homology (1). PDGFRα homodimers bind all PDGF isoforms except those containing PDGF D. PDGFRβ homodimers bind PDGF BB and DD isoforms, as well as the PDGF AB heterodimer. The heteromeric PDGF receptor α/β binds PDGF B, C, and D homodimers, as well as the PDGF AB heterodimer (2). PDGFRα and PDGFRβ can each form heterodimers with EGFR, which is also activated by PDGF (3). Various cells differ in the total number of receptors present and in the receptor subunit composition, which may account for responsive differences among cell types to PDGF binding (4). 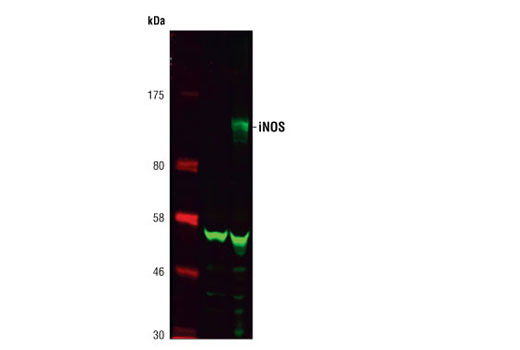 Ligand binding induces receptor dimerization and autophosphorylation, followed by binding and activation of cytoplasmic SH2 domain-containing signal transduction molecules, such as GRB2, Src, GAP, PI3 kinase, PLCγ, and NCK. A number of different signaling pathways are initiated by activated PDGF receptors and lead to control of cell growth, actin reorganization, migration, and differentiation (5). Tyr751 in the kinase-insert region of PDGFRβ is the docking site for PI3 kinase (6). 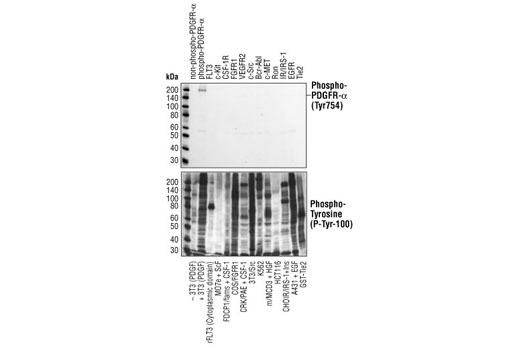 Phosphorylated pentapeptides derived from Tyr751 of PDGFRβ (pTyr751-Val-Pro-Met-Leu) inhibit the association of the carboxy-terminal SH2 domain of the p85 subunit of PI3 kinase with PDGFRβ (7). Tyr740 is also required for PDGFRβ-mediated PI3 kinase activation (8). Background: ASF1 was first identified in S. cerevisiae based on its ability to de-repress transcriptional silencing when overexpressed (1). While only one gene exists in yeast and Drosophila, mammalian cells contain the two highly homologous ASF1A and ASF1B genes (2). ASF1A and ASF1B function as histone chaperones, delivering histone H3/H4 dimers to CAF-1 or HIRA histone deposition complexes to facilitate replication-coupled and replication-independent nucleosome assembly on DNA (2-5). 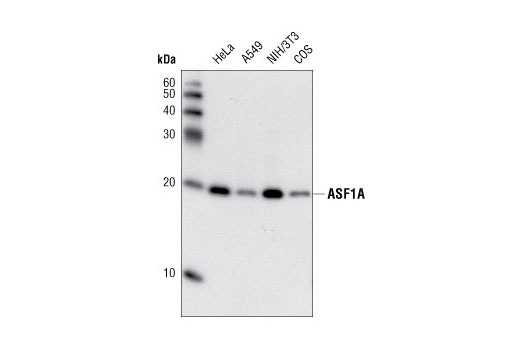 Both ASF1A and ASF1B bind to CAF-1, but only ASF1A binds to HIRA (5). In addition to playing a role in DNA replication and gene silencing, ASF1 functions in DNA damage repair, genome stability and cellular senescence. Deletion of ASF1 in yeast and Drosophila confers sensitivity to various DNA damaging agents and inhibitors of DNA replication, increases genomic instability and sister chromatid exchange, and activates the DNA damage checkpoint (6-8). Depletion of both ASF1A and ASF1B in mammalian cells results in the accumulation of cells in S phase, increased phosphorylation of H2A.X, centrosome amplification and apoptosis (9,10). ASF1A is required for the formation of senescence-associated heterochromatin foci (SAHF), with overexpression of ASF1A inducing senescence in primary cells (4). Both ASF1A and ASF1B are phosphorylated in S phase by the Tousled-like kinases TLK1 and TLK2, and are dephosphorylated when TLK1 and TLK2 are inactivated by Chk1 kinase in response to replicative stress (11,12). The function of ASF1 phosphorylation is not yet understood. 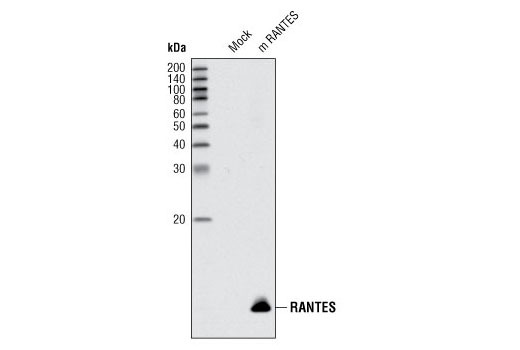 Background: RANTES/CCL5 (regulated upon activation, T cell expressed and secreted) is a member of the "C-C" or β family of chemokines that induce inflammation and are associated with a number of inflammatory disorders (1,2). 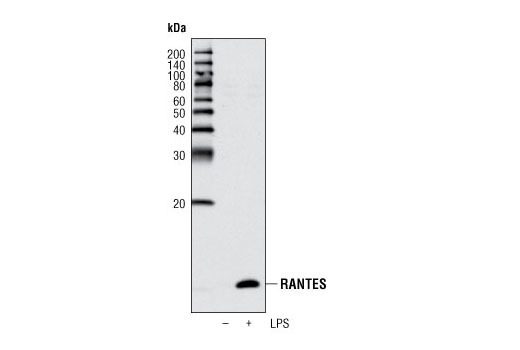 RANTES is produced and secreted mainly by CD8+ T cells, macrophages, and platelets, as well as epithelial cells, fibroblasts and some solid tumors (2-7). 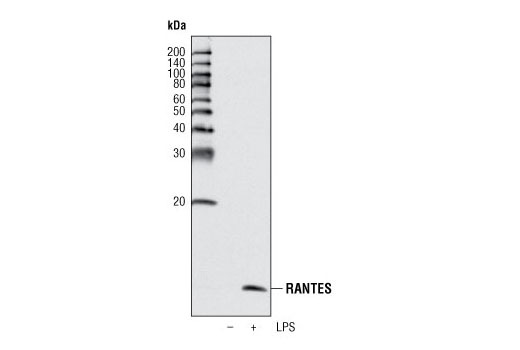 RANTES acts as a chemoattractant and has other regulatory functions on a number of cell types including monocytes, memory T cells, NK cells, eosinophils, basophils, dendritic cells, and mast cells (3, 7-9). Signaling by RANTES is mediated by several G-protein coupled receptors (GPCRs), including CCR1, CCR3, CCR4 and CCR5. Background: CNPase (2', 3’-cyclic nucleotide 3'-phosphodiesterase) catalyzes the in vitro hydrolysis of 2’, 3’-cyclic nucleotides to produce 2’-nucleotides. 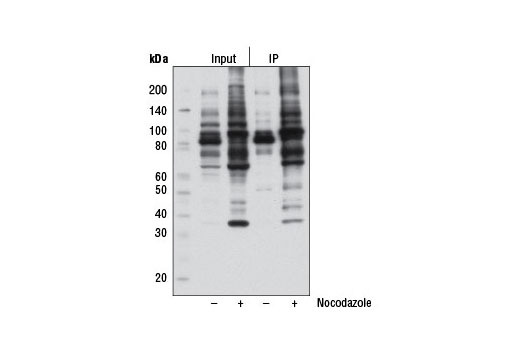 The in vivo molecular function and native substrate of this nucleotide phosphodiesterase remains under investigation (1). 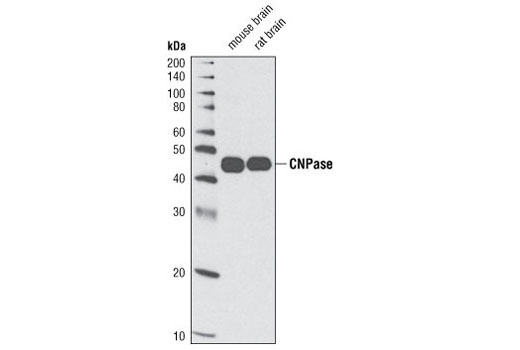 High CNPase expression is seen in oligodendrocytes and Schwann cells as CNPase accounts for roughly 4% of the total myelin protein in the central nervous system (2). CNPase binds to tubulin heterodimers and plays a role in tubulin polymerization, and oligodendrocyte process outgrowth (3). Typical myelination is seen in CNPase knock-out mice, but they suffer severe neurodegeneration from axonal loss and oligodendrocytes display abnormal paranodal loop structure prior to axonal degeneration. Paranodal loops typically contact the axolemma in axon-glial signaling; neurodegeneration in CNPase knock-out mice is a secondary consequence of impaired cell-cell communication (4). 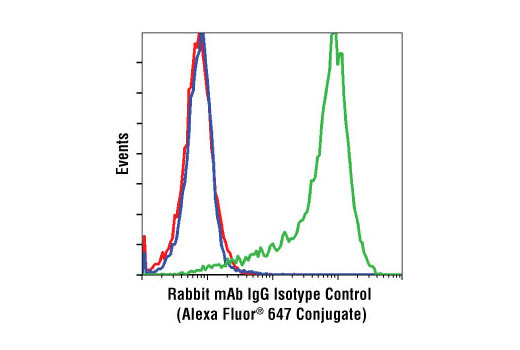 This Cell Signaling Technology antibody was conjugated to Alexa Fluor® 647 fluorescent dye and tested in-house for direct flow cytometric analysis of human cells. Background: Isotype control antibodies are used to estimate the nonspecific binding of target primary antibodies due to Fc receptor binding or other protein-protein interactions. An isotype control antibody should have the same immunoglobulin type and be used at the same concentration as the test antibody. Background: Lck belongs to the Src-like non-receptor tyrosine kinase family with the typical Src family kinase structure: a unique amino terminal domain (Src homology 4 domain, SH4) followed by an SH3 domain, an SH2 domain, a kinase domain (SH1), and a carboxy-terminal negative regulatory domain (1). Lck activity is controlled by the interactions of SH2 and SH3 domains as well as tyrosine phosphorylation status of the activation loop (2,3). Lck is recruited to the T cell receptor (TCR) complex upon stimulation and activates downstream tyrosine kinases to initiate T cell signaling (4). Lck is also found to be involved in the regulation of mitochondrial apoptosis pathways and may be responsible for some anticancer drug induced apoptosis (5,6). Background: Nitric Oxide Synthase (NOS) catalyzes the formation of nitric oxide (NO) and citruline from L-arginine, oxygen and cofactors. Three family members have been characterized: neuronal NOS (nNOS), which is found primarily in neuronal tissue; inducible NOS (iNOS), which is induced by interferon gamma and lipopolysaccharides in the kidney and cardiovascular system; and endothelial NOS (eNOS), which is expressed in blood vessels (1). NO is a messenger molecule with diverse functions throughout the body including the maintenance of vascular integrity, homeostasis, synaptic plasticity, long-term potentiation, learning, and memory (2,3). Background: The 14-3-3 proteins are a highly conserved family of proteins involved in the regulation of cell survival, apoptosis, proliferation and checkpoint control (1-5). 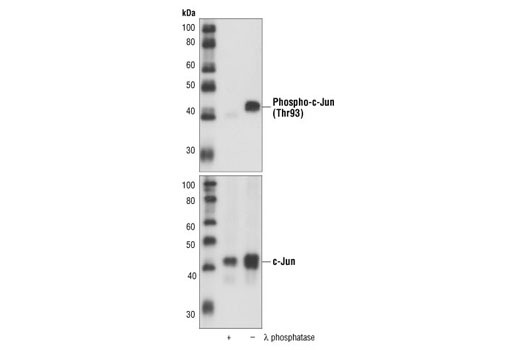 Binding of 14-3-3 is mediated through phospho-serine-containing proteins (6). Two different phospho-serine containing motifs are found using a degenerate phospho-serine-oriented peptide library technique, RSXS*XP and RXY/FXS*XP (6). Motif 2 (RXY/FXS*XP) is found in critical regulatory proteins including cdc25A, cdc25B, PKCgamma, IRS-1 and BCR (6). 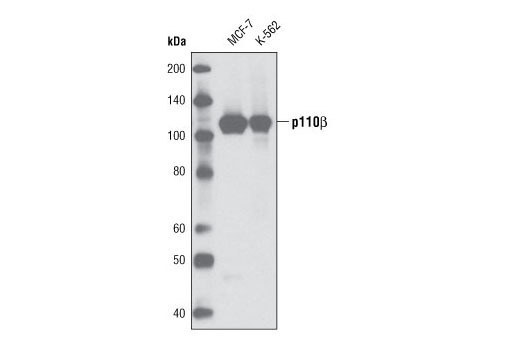 Although Phospho-(Ser) Arg-X-Tyr/Phe-X-pSer Motif Antibody binds 14-3-3 binding motif 2 with no requirement for proline in the +2 position, it provides a powerful tool for the discovery and characterization of potential 14-3-3 binding motif 2-containing proteins or other proteins with the RXY/FXS* motif. Background: Caldesmon-1 is an actin filament stabilizing protein involved in the regulation of cell contraction. 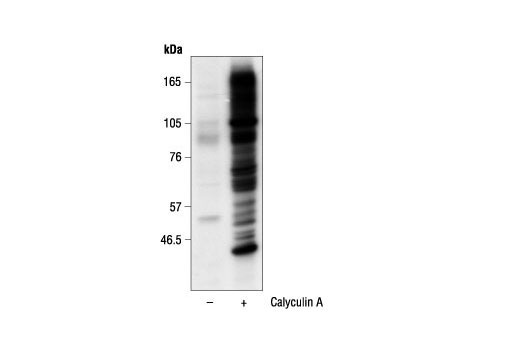 Binding of caldesmon-1 to actin is weakened by phosphorylation and by calmodulin in the presence of calcium. 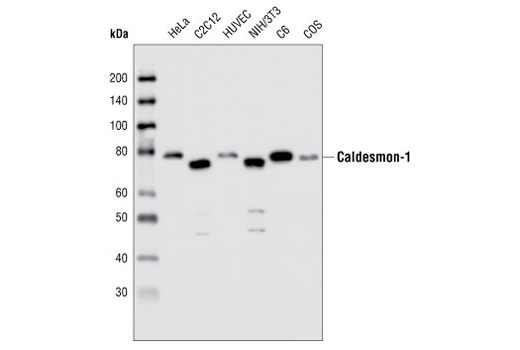 Caldesmon-1 is encoded by a single gene, which is spliced to generate a widely distributed low molecular weight form and a smooth muscle specific high molecular weight form (1,2). Caldesmon-1 is phosphorylated by the cyclin dependent kinase cdc2 and Erk1/2 MAP kinase, both of which prevent the activity of caldesmon-1 (3-5). Phosphorylation of caldesmon-1 by cdc2 is required for passage of cells through mitosis (6). Phosphorylation by Erk1/2 is important in regulating smooth muscle contraction (7). Caldesmon-1 activity may play a role in the formation of podosomes, adhesion complexes associated with the secretion of matrix metalloproteases, invasion, and metastasis (reviewed in 5). Background: There are three members of the steroid receptor co-activator (SRC) family of proteins: SRC-1 (NCoA-1), SRC-2 (TIF2/GRIP1/NCoA-2), and SRC-3 (ACTR/pCIP/RAC3/TRAM-1/AIB1). All SRC family members share significant structural homology and function to stimulate transcription mediated by nuclear hormone receptors and other transcriptional activators such as Stat3, NF-κB, E2F1, and p53 (1-4). 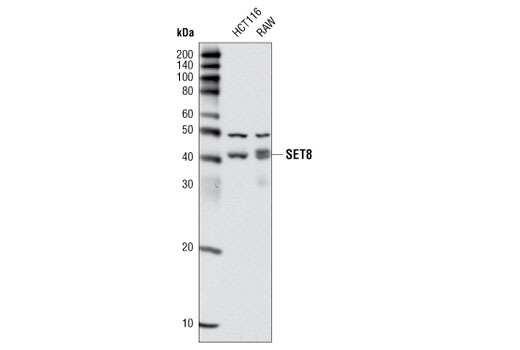 Two SRC proteins, SRC-1 and SRC-3, function as histone acetyltransferases (5,6). In addition, all three family members can recruit other histone acetyltransferases (CBP/p300, PCAF) and histone methyltransferases (PRMT1, CARM1) to target promoters and cooperate to enhance expression of many genes (5-8). 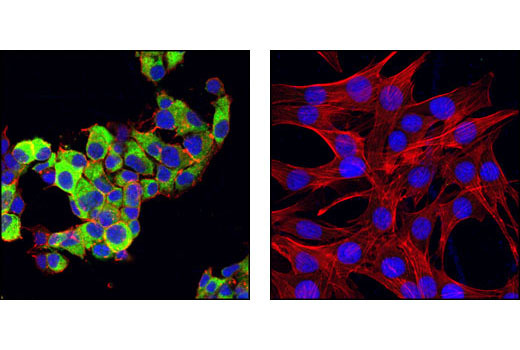 The SRC proteins play important roles in multiple physiological processes including cell proliferation, cell survival, somatic cell growth, mammary gland development, female reproductive function, and vasoprotection (9). SRC-1 and SRC-3 are conduits for kinase-mediated growth factor signaling to the estrogen receptor and other transcriptional activators. Seven SRC-1 phosphorylation sites and six SRC-3 phosphorylation sites have been identified, which are induced by steroids, cytokines, and growth factors and involve multiple kinase signaling pathways (9-11). Research has shown that all three SRC family members are associated with increased activity of nuclear receptors in breast, prostate, and ovarian carcinomas. According to the literature, SRC-3 is frequently amplified or overexpressed in a number of cancers (12), and SRC-1/PAX3 and SRC-2/MYST3 translocations are found associated with rhabdomyosarcoma and acute myeloid leukemia, respectively (13,14).